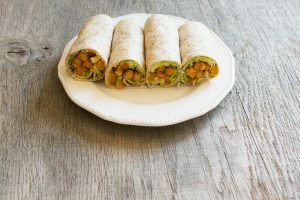 Red grapes, a good source of resveratrol, a phytonutrient with antioxidant and anti-inflammatory qualities, are the sweet, juicy surprise in this delicious wrap. Satiating plant-based protein comes from chickpeas and walnuts, which are also high in cancer-preventive fiber. 2. On bottom half of tortilla, spoon 1⁄2 cup mixture in broad line. 3. Fold left and right sides toward center until almost touching. Fold bottom edge toward center. Roll wrap firmly upwards and place toothpick 2 inches from each end. 4. Slice wrap diagonally and place cut side up on plate or platter. Repeat. 5. Serve immediately or cover and refrigerate to serve later in the day. *Large lettuce leaves can be substituted for tortillas and used to “wrap” the salad. Nutrition information: Makes 8 servings (2 halves per serving. Per serving: 367 calories; 10 grams total fat; 1 gram saturated fat; 58 grams carbohydrates; 15 g protein, 10g dietary fiber, 425 mg sodium.